If you like this post please LIKE it on facebook or g+1 it. Thanks, it really helps us grow. To gain an appropriate sailing license to sail in the Mediterranean is now a simple process. To put some logic to it – think about it like this: to gain an international sailing license, you must have sufficient and proper experience as a skipper on a large keelboat before a yacht charter company in a foreign country will rent you a boat of a similar size. Be aware of a holding a license with little sailing experience. While you might have a “license”, no charter company will rent you a boat without sufficient experience or a proper resume. You’ll simply be left on the doc holding a piece of paper or you’ll have to hire a skipper for the week. Yacht Charter Companies don’t merely accept a certificate or license they also require a proper sailing resume. Makes sense right? Read this article for more info on this: Why a Resume trumps a certification every time. At NauticEd, we are yacht charter agents also and we often see sailing licenses where the holder has little sailing experience. They get turned down to be able to skipper for the charter. The following is the reality about the ICC: The ICC is a United Nations created Certificate of Competence for pleasure craft operators. It was created under resolution 40 and signed mostly by European countries although South Africa also signed the resolution. The United States did not, nor did Canada. Thus there are no sailing bodies or associations in the USA or Canada who can offer the ICC through those governments. ICC’s can only be written through signatory countries to the ICC. So in North America, typically the ICC is written through the Royal Yachting Association out of the UK of which there are three locations – Florida, Toronto, and Halifax. If you are close to any of those locations then it makes sense to get the ICC. The SLC: More recently the SLC is also available as an acceptable license for the Mediterranean. The SLC is administered by NauticEd and is accepted by every Yacht Charter company in the Mediterranean. There are many accessible schools through out North American able to issue the SLC. Below we show a handy infographic showing the paths to ICC and SLC licensure. And here is the text explanation of the above. Regardless of how you gain the ICC, you must also have an acceptable resume to satisfy the yacht charter company that you are skipper experienced on a similar size boat. NauticEd offer a free resume building tool online. It keeps track of and presents a full resume in a manner accepted by every yacht charter company showing all your sailing experience and splits it out according to boat size, how recent the experience is, and if catamaran or monohull. To see a NauticEd example student resume go to www.nauticed.org/student_verification and enter the credentials of Joe Sailor on that page. The first is a simple assessment of your theory knowledge and sailing competence by an RYA qualified instructor. The assessment takes one day. It is a pass/fail assessment whereby no instruction is given. You’ll need to be very knowledgeable on theory topics like navigation, tides and rules, plus you had better be pretty good at sailing, and maneuvering the boat in and around the marina, including Mediterranean mooring, springing on and off, and backing the boat. The one-day assessment is a slightly grueling assessment of your theory knowledge as well. But don’t be intimidated, just make sure you know your stuff. There is a heavy emphasis on the theory knowledge of navigation (plotting courses, currents, tides, chart work, day and night ATONs and markers), passage planning, and navigation rules of the road in the assessment. For example, can you draw a North, South, East and West Cardinal Mark? What is the distinguishing light of a safe water marker or an isolated danger mark? Can you calculate at what time could you enter a shallow harbor given the tide almanac? Your sailboat under sail is overtaking a small powerboat on your port side, who must give way? In IALA-A is it Red Right Returning or Red to Red on Return? What about IALA-B? Given a specific current flow rate and direction changing over a tide cycle, could you plot a series of courses to arrive at a destination and estimate the time of arrival? What about fire extinguishers, can you name on the spot the best types of extinguishers for the type of fire? Thus you should learn and get comfortable with this in the theory training online prior to the assessment. The last thing you want to do is fail. Most sailors can not “wing” this assessment without some study (even experienced sailors). Given this, our North American assessors will not allow you to test out of the assessment without having completed a significant theory knowledge course. We recommend either the NauticEd Bareboat Charter Master bundle of online courses or the RYA Day Skipper online theory course. They simply do not like to fail people but will if they try to wing it. Usually, we find the sailor is practically competent but are lacking on the specifics of the theory. This is why we strongly suggest the student to take the online classes prior to the event else your approximate (depending on location and school) $400 assessment fee could be wasted. Additionally, we have schools worldwide who can give you training prior to the assessment – we call that a “rust-out” day. 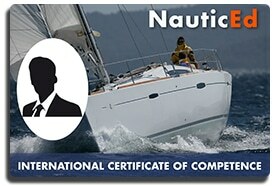 The second method is that you gain the RYA Day Skipper Certificate which automatically qualifies you for the ICC. To gain the RYA Day Skipper Certificate, you need to do a theory course online and a practical 5-day sailing training adventure at an RYA school. First, pass the theory course for RYA Day Skipper which you can do online through NauticEd. The course is quite extensive and covers everything required by the United Nations Resolution 40. See below for the UN knowledge requirements. No matter your experience, we also guarantee that you will gain some great sailing knowledge. You can also do a viable alternative to the ICC if there is not an ICC location near you. Jump here to learn about the SLC. 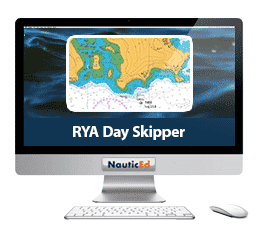 The NauticEd RYA Day Skipper online course requires a real person to take the time to grade your exam and that you do the exam with RYA Charts and an Almanac which we include in the cost of the course. Thus, the cost is a bit more than our regular other eLearning courses. The full RYA Day Skipper course is $394. When you pass this course – you are issued with the RYA Day Skipper Theory Course and Exam complete certificate. Your practical time on the water after that is a breeze, you’ll be doing no exams on the water. To complete the RYA Day Skipper Certification, take the 5-day vacation/learn to sail sailing course. By the end of the 5-day training, as long as you demonstrate competence to the standard then you will be issued the RYA Day Skipper Certificate. This automatically qualifies you for the ICC and NauticEd will arrange this for you upon passing the theory and Practical. Visit one of the schools listed above. (1) Doing the one-day on-the-water assessment. We recommend either the NauticEd Bareboat Charter Master bundle of online courses or the theory course for RYA Day Skipper course prior to the assessment else you will likely fail. (2) Gain the RYA Day Skipper Certificate via the RYA Day Skipper online course and the 5-day on-the-water training at an RYA training center. If you pass the course over the 5 days, this then automatically qualifies you for the ICC. Which Path to the ICC do we recommend? Well, it really depends on you. If you are open to learning new tricks and tips and get some solid formal training, you can not beat the full RYA Day Skipper route. If you think you know enough practical, then do the assessment after having passed the Bareboat Charter Master Bundle of courses. But again, know your stuff. Don’t show up a bit “rusty”. For the North American sailor, if an RYA location is not close to you, we recommend that you gain the NauticEd SLC license as an alternative. The SLC works in all countries in Europe including Croatia. The SLC is relatively easy to get but has slightly higher standards than the ICC; meaning you have to know your stuff – even more. To gain the NauticEd SLC you complete the NauticEd Bareboat Charter Master bundle of courses online, log your past history sailing experience in our electronic logbook online (which must add to at least 50 days of experience) and do a 1-day assessment similar in scope to the practical ICC assessment at a qualified NauticEd School using these Bareboat Charter Skills Assessment rubrics. Learn more about the NauticEd SLC Mediterranean Sailing License here. Traffic regulations applicable on inland waters, in particular, CEVNI (European Code for Inland Waterways), and/or in coastal waters, in particular, the Regulations for Preventing Collisions at Sea, including aids to navigation (marking and buoyage of waterways). (g) general knowledge of navigation, in particular establishing a position and deciding a safe course.